33 If your brothers are part of you, will you accept them? Only they can teach you what you are, and your learning is the result of what you taught them. What you call upon in them, you call upon in yourself. And as you call upon it in them, it becomes real to you. God has but one Son, knowing them all as one...Every Soul God created is part of you and shares His glory with you. His Glory belongs to Him, but it is equally yours. You cannot, then, be less glorious than He is. 1 If you will lay aside the ego's voice, however loudly it may seem to call; if you will not accept its petty gifts which give you nothing that you really want; if you will listen with an open mind, which has not told you what salvation is; then you will hear the mighty Voice of truth, quiet in power, strong in stillness, and completely certain in its messages. 2 Listen, and hear your Father speak to you through His appointed Voice, Which silences the thunder of the meaningless and shows the way to peace to those who cannot see. Be still today and listen to the truth. Be not deceived by voices of the dead which tell you they have found the source of life and offer it to you for your belief. Attend them not, but listen to the truth. 3 Be not afraid today to circumvent the voices of the world; walk lightly past their meaningless persuasion. Hear them not. Be still today, and listen to the truth. Go past all things which do not speak of Him Who holds your happiness within His hand, held out to you in welcome and in love. Hear only Him today, and do not wait to reach Him longer. Hear one Voice today. 4 Today the promise of God's Word is kept. Hear and be silent. He would speak to you. He comes with miracles a thousand times as happy and as wonderful as those you ever dreamt or wished for in your dreams. His miracles are true. They will not fade when dreaming ends. They end the dream instead and last forever, for they come from God to His dear Son, whose other name is you. 5 Prepare yourself for miracles today. Today allow your Father's ancient pledge to you and all your brothers to be kept. Hear Him today, and listen to the Word which lifts the veil which lies upon the earth and wakes all those who sleep and cannot see. God calls to them through you. He needs your voice to speak to them, for who could reach God's Son except his Father calling through your Self? 6 Hear Him today, and offer Him your voice to speak to all the multitudes who wait to hear the Word that He will speak today. Be ready for salvation. It is here and will today be given unto you. And you will learn your function from the One Who chose it in your Father's Name for you. 7 Listen today, and you will hear a Voice Which will resound throughout the world through you. 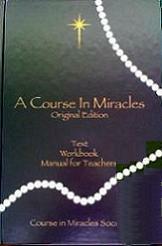 The Bringer of all miracles has need that you receive them first and thus become the joyous giver of what you received. Thus does salvation start and thus it ends; when everything is yours, and everything is given away, it will remain with you forever. And the L e s s o n has been learned. 9 I will be still and listen to the truth. What does it mean to give and to receive? 10 Ask and expect an answer. Your request is one whose answer has been waiting long to be received by you. It will begin the ministry for which you came and which will free the world from thinking giving is a way to lose. And so the world becomes ready to understand and to receive. 13 Let me be still and listen to the truth. I am the messenger of God today. My voice is His, to give what I receive. 31 How can you become increasingly aware of the Holy Spirit in you except by His effects? You cannot see Him with your eyes nor hear Him with your ears. How, then, can you perceive Him at all? If you inspire joy, and others react to you with joy even though you are not experiencing joy yourself, there must be something in you that is capable of producing it. If it is in you and can produce joy, and if you see that it does produce joy in others, you must be dissociating it in yourself. 32 It seems to you that the Holy Spirit does not produce joy consistently in you only because you do not consistently arouse joy in others. Their reactions to you are your evaluations of His consistency. When you are inconsistent, you will not always give rise to joy and so you will not always recognize His consistency. What you offer to your brother, you offer to Him because He cannot go beyond your offering in His giving. This is not because He limits His giving, but simply because you have limited your receiving. The will to receive is the will to accept. 33 If your brothers are part of you, will you accept them? Only they can teach you what you are, and your learning is the result of what you taught them. What you call upon in them, you call upon in yourself. And as you call upon it in them, it becomes real to you. God has but one Son, knowing them all as one. Only God Himself is more than they, but they are not less than He is. Would you know what this means? If what you do to my brother you do to me, and if you do everything for yourself because we are part of you, everything we do belongs to you as well. Every Soul God created is part of you and shares His glory with you. His Glory belongs to Him, but it is equally yours. You cannot, then, be less glorious than He is. 34 God is more than you only because He created you, but not even this would He keep from you. Therefore you can create as He did, and your dissociation will not alter this. Neither God's light nor yours is dimmed because you do not see. Because the Sonship must create as one, you remember creation whenever you recognize part of creation. Each part you remember adds to your wholeness because each part is whole. Wholeness is indivisible, but you cannot learn of your wholeness until you see it everywhere. You can know yourself only as God knows His Son, for knowledge is shared with God. When you awake in Him you will know your magnitude by accepting His limitlessness as yours, but meanwhile you will judge it as you judge your brothers' and will accept it as you accept theirs. 35 You are not yet awake, but you can learn how to awaken. Very simply the Holy Spirit teaches you to awaken others. As you see them waken, you will learn what waking means, and because you have willed to wake them, their gratitude and their appreciation of what you have given them will teach you its value. They will become the witnesses to your reality, as you were created witnesses to God's. Yet when the Sonship comes together and accepts its oneness, it will be known by its creations, who witness to its reality as the Son does to the Father. 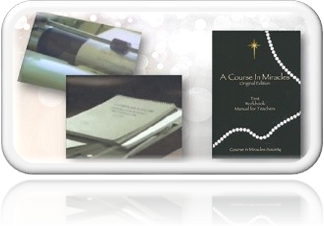 36 Miracles have no place in eternity because they are reparative. Yet while you still need healing, your miracles are the only witnesses to your reality which you can recognize. You cannot perform a miracle for yourself because miracles are a way of giving acceptance and receiving it. In time, the giving comes first, though they are simultaneous in eternity, where they cannot be separated. When you have learned that they are the same, the need for time is over. 37 Eternity is one time, its only dimension being "always." This cannot mean anything to you, however, until you remember God's open arms and finally know His open Mind. Like Him, you are "always"-in His mind and with a mind like His. In your open mind are your creations, in perfect communication born of perfect understanding. Could you but accept one of them, you would not want anything the world has to offer. Everything else would be totally meaningless. God's meaning is incomplete without you, and you are incomplete without your creations. Accept your brother in this world and accept nothing else, for in him you will find your creations, because he created them with you. You will never know that you are co-creator with God until you learn that your brother is a co-creator with you. The Lessons we have been looking at in this last section are about helping us access the truth in our minds so we can experience the love, peace, and joy of the Christ Self we are. Through our everyday experiences that offer us all the opportunities for the healing we need, we are being asked to let go of the ego programming that is so entrenched in our thought system. We experience a lot of resistance in this process because we are very invested in our identity as a body and personality. Jesus tells us that we have overlearned the ego programming, which is why it is so challenging to release. When we listen to our thoughts, we can see how obsessive they are. They are tapes that play over and over in our minds, ruminating on the same problems, the same grievances, the plans and expectations we have, our frustrations, worries and anxieties, and all thoughts, keeping us from hearing the truth of who we are. They are fear-based thoughts that block the love shining in us all the time. Sometimes we are aware of these tapes and other times they play in the background of our minds. Mostly, they run our lives without our awareness until we learn to watch our thoughts so we can bring this conditioned mind to awareness and realize how we have been deceived by its lies. The conditioned mind holds many beliefs. These beliefs run our lives and dictate our actions. Beliefs such as: "Women/men can't be trusted." "Love is dangerous because I always get hurt." "I can only depend on myself." "If I don't defend myself, I will be a doormat for others to take advantage of me." "I can't trust anyone not to hurt me." "I need to get what I can." "I must take care of myself above all." "I am not worthy." When these beliefs and millions of others we hold are not conscious, we do not understand why certain events keep happening to us. We define ourselves as a certain type of person and seem to get stuck in various roles we play as a brother, sister, husband, wife, daughter, employee, loser, gambler, lover, nurturer, and victim. But roles offer no rewards. When we become conscious of our hidden beliefs that run our lives, we can choose to release them. One way we become aware of these beliefs is to look at what we are projecting onto others. Another way is to look at the feelings that come up in us and trace them back by asking, "What must I believe about myself for this to arise?" Another way is to become aware of how we defend against being hurt. When I get hurt, for example, I tend to withdraw. I feel safer in my aloneness. We each have preferred ways in which we protect ourselves from pain. It is important to look at our defense strategies, as they show us where we feel vulnerable to attack. When our minds are crowded with self-attack thoughts, we will not hear the truth. The truth is in the stillness. Jesus tells us that the voice of the ego is a very loud, thunderous voice. It deceives us into believing what is not true. It is a noisy and boisterous voice, always demanding our attention and attempting to distract us from experiencing the Christ Self within. Stillness is like rat poison to the ego because stillness opens us up to " ' The peace of God which passeth understanding . '" 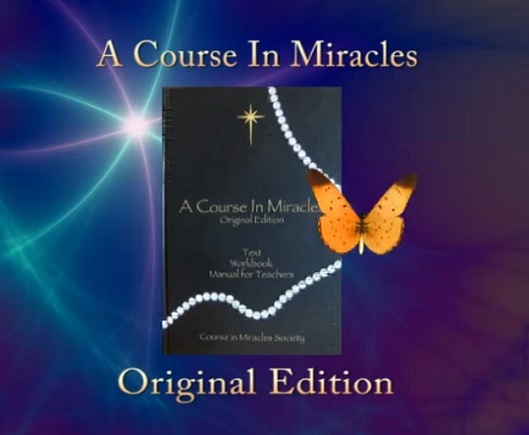 (T.2.II.1.9) (ACIM OE T.2.II.18) This is the last thing the ego wants us to experience; but the Christ in us is given birth on ground we have helped to prepare for holiness to be revealed to us. This ground is a place of stillness in the mind. In the stillness of the holy instant, we enter the eternal present where Christ dwells and where the recognition of Christ within dawns upon us. The voice of the ego is a very persuasive voice. It insists that the meaningless things of the world are where our happiness lies. It keeps us blind to the truth. It is important to see that we are not asked to analyze the meaning of this voice but to circumvent it. "Walk lightly past their meaningless persuasion. Hear them not. Be still today and listen to the truth . " (W.106.3.2-4) "Be not deceived by voices of the dead, which tell you they have found the source of life and offer it to you for your belief . " (W.106.2.3) We are being asked not to listen to the ego in anyone. The voices of the dead are actually the voices of those who are speaking from their ego. Jesus tells us that the life we seem to be living in this world is not life at all. We have become convinced that the source of our life is our bodily experience in the world, starting with our birth in the body. What we call life seems to come through the body, but the body is nothing. It is a dream figure, and when we identify with it, it becomes an obstacle to the truth. "What has the body really given you that justifies your strange belief that in it lies salvation?" 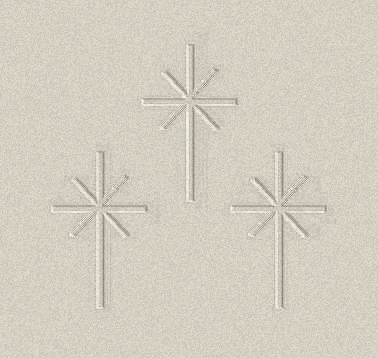 (T.19.IV.B.2.6) (ACIM OE T.19.V.b.61) Our reality is the eternal Christ Self. The Bible says that we are created in the image of God, yet it is an image of a dualistic God. Jesus says, do not listen to this as it is not the truth of who we are. God is only love, and we were created in His image as love. As part of God, we have all the same characteristics that He has. The voices of this world that seem to witness to an individual self do not exist and have no reality. We resist what Jesus is teaching and find it difficult to accept because the teaching is not in keeping with the authorities of this world. We must turn away from the pressures of those who speak of their belief in fear, belief in death, and belief that suffering can offer us something. If we invest in the voices of the ego, we cause ourselves increased suffering and pain. We don't need to do this anymore. We need to see the false as false. "It [the miracle] merely looks on devastation, and reminds the mind that what it sees is false . " (W.PII. What is the Miracle? Q13.1.3) We can make another choice. We can go past all the voices of the world and say no to the ego's persuasive voice. It may keep talking, but when we don't listen to it, it drifts off into the background of our minds. We are not these separated selves with a name and a body, as the ego insists. We are being reminded of who we really are. We are invited to accept the glorious gifts given us in our creation and are with us now. We can choose against the shabby gifts of the ego. They offer us nothing but pain. 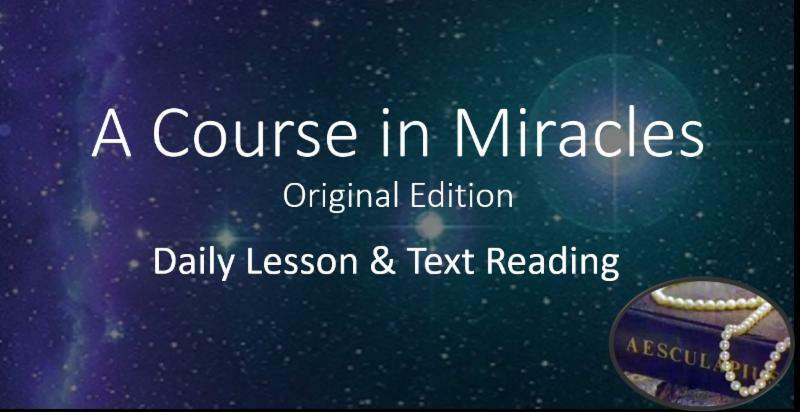 Jesus helps us to see in this Course that our "normal" state of mind is similar to what the Buddhists call "monkey mind", which is a mind constantly leaping from one thing to another, endlessly chattering and never still. The ego thoughts that normally occupy this mind are described in the Course as "raucous screams and senseless ravings . " 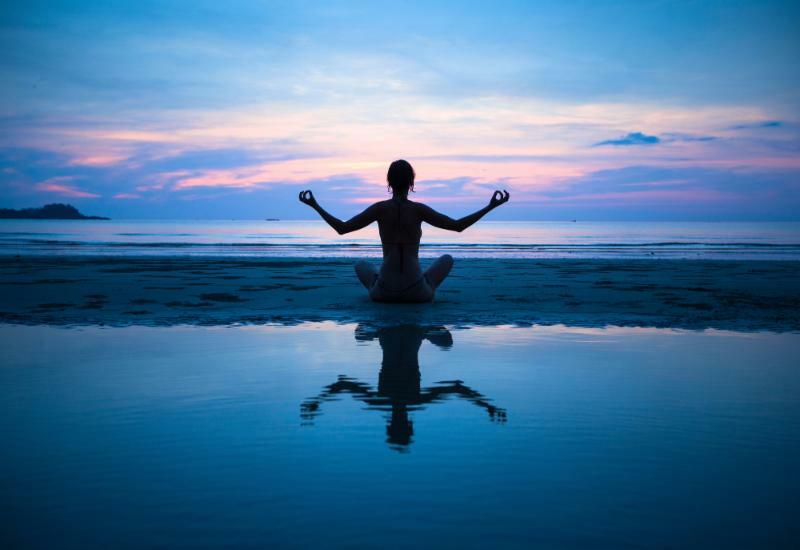 (T.21.V.1.6) (ACIM OE T.21.VI.49) This mind is constantly occupied with ". . . the frantic, riotous thoughts and sights and sounds of this insane world . " (W.49.4.4) We are constantly talking in our minds. We review our past and have fantasies about the future. We narrate our experiences in the world, talking to ourselves about what we are doing, and thus we never experience the stillness that this and other Lessons remind us are in us. In a nutshell, this mind is in a state of conflict. It is constantly at war, both with the external world and within itself. If we pause to look at our thoughts, we can see the insanity going on in our minds. Our focus is almost entirely on our survival on the physical and emotional level, constantly defending against threats to the safety of the body and threats to the psychological self. Even these thoughts are not a united front since we hold conflicting goals. No wonder when we first start with these Lessons, things seem to get worse for us; the thoughts we had not previously recognized now become more apparent to us. Jesus frequently invites us to take a moment and let go of everything that normally occupies our minds, as in the following passage: "Let us be still an instant, and forget all things we ever learned, all thoughts we had, and every preconception that we hold of what things mean and what their purpose is. Let us remember not our own ideas of what the world is for. We do not know . " (T.31.I.12.1-3) (ACIM OE T.31.I.12) (See also T.31.II.8, ACIM OE T.31.II.22, and W.189.7) We will only be willing to "be still and listen to the truth," (W.106) when we truly come to believe in His promises. " He comes with miracles a thousand times as happy and as wonderful as those you ever dreamed or wished for in your dreams . " (W.106.4.4) This is quite a promise. It means no matter how wonderful our manifestations are of what we think will make us happy, they offer us nothing except more guilt. His peace and joy will surpass all of this and a thousand times more. When we have an experience of His truth, we bring it to the world. Sometimes we extend to others with words that come through us and sometimes with just our thoughts and our presence. We need to receive the miracles first so we can extend them. "The bringer of all miracles has need that you receive them first, and thus become the joyous giver of what you have received . " (W.106.6.5) We are told that we waste a lot of time when we resist taking up our function of forgiveness. We are learning about the meaning of giving and receiving, and he says, "Your request is one whose answer has been waiting long to be received by you . " (W.106.8.2) It is through forgiveness that we learn to be still and listen to the truth. Have you wondered what we are in this world for? Why are we here at all? For most of us, we probably don't think of our function in the world as some kind of ministry, yet that is how it is described here. We have an important ministry in demonstrating the choice for healing that all can make. The Healer is available in all minds, and the power of decision is available to all of us when we are ready. The way of the world is to believe that when we give, we lose, yet "Today the holy Word of God is kept through your receiving it to give away, so you can teach the world what giving really means by listening and learning it of Him." (W.106.10.1) We teach only by example. We become a demonstration of the healing we have accepted for ourselves. What this requires is that we must let go of our grievances, our attacks, our fears, and our belief in sacrifice. Through forgiveness, the love we are extends to the Sonship, as we are One Mind. This is how we bring healing to the world. We hear the message by allowing the truth to be itself as it extends through us. It certainly does not mean preaching. It is only about the Holy Spirit extending through us. "Your peace surrounds me, Father. Where I go, Your peace goes there with me. It sheds its light on everyone I meet. I bring it to the desolate and lonely and afraid. I give Your peace to those who suffer pain, or grieve for loss, or think they are bereft of hope and happiness. Send them to me, my Father. Let me bring Your peace with me . " (W.245.1.1-7) This whole process of receiving, giving, and recognizing that we have by giving, is foundational to Course teaching. We become channels for the Holy Spirit, receiving everything from Him, and in giving it away, we have it forever. We can only know we have when we give. The Lesson assumes, quite rightly, that we don't understand this kind of giving to receive, which he is talking about. We think of giving as loss and sacrifice. Now we accept the truth, "I will be still and listen to the truth. What does it mean to give and to receive?" (W.106.7.5-6) The answer is to accept the Atonement for ourselves. To accept the Atonement is to accept the correction. We need not take responsibility for the error but we need only to be constantly willing to receive His correction. It is the realization that the answer is and always has been within. We only need to take our problem to the answer, rather than listen to the ego whose solution keeps us invested in the illusion and in our pain and suffering. In this process, our individuality and specialness are released, and we are not so enamored with our own thoughts, realizing there is just one identity as Christ, and we are all the same. We no longer have to defend our own way or compete for attention with others. There is no need then to make anything here important. Our strength lies in connecting to the stillness within the right mind. We can then release our need to show the world our special self, and instead, we allow the stillness of God in us to communicate His peace. Thus, we will "Hear Him today, and listen to the Word which lifts the veil that lies upon the earth, and wakes all those who sleep and cannot see. God calls to them through you." (W.106.5.1-2) All minds are One. As we listen and respond to His call, we are guided by His love, and everything we think and do comes from His love.